Granted, my background and training are insufficient to explain or understand the full range of possibilities for abiogenesis, but it seems clear to me that the first life had precursors which evolved. Abiogenesis is presented as a “Holy Grail” of sorts, something for which we lack the fossil evidence and will likely never find, and that science is still “in the dark” on the issue. I have a problem with the idea that there may have been an abiogenesis “event” that anyone would ever be able to clearly mark as the start of life and then evolution. The definition of “life” is not a clear one. It seems to me like the definition of a planet. Planets were once defined as objects which move in regular orbits in our skies, and even the moon and the sun were considered planets. 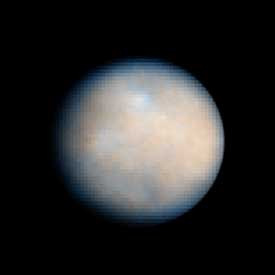 As astronomical discoveries advanced, the definition of the word planet became much more problematic as early as 1801 when Piazza discovered Ceres. It wasn’t considered a planet because it was small, and yet it has a regular orbit. The International Astronomical Union upset school children and astrologers when they “demoted” Pluto from “planet” to “minor planet” with a new definition of the word. I was amused that astrologers complained about not being consulted, because it screwed up all of their charts. How? Changing the nomenclature doesn’t change its essence. My take: It is high time all of these statements be discarded or highly modified. They are basically lazy, all-too-easy responses relying on hair-splitting technicalities or nearly philosophical assertions of the “even if the creationists were empirically correct on this point, which they aren’t but I’m too busy to back it up right now, it wouldn’t matter” variety. And the worst part is that these sorts of statements mis-describe the actual state of the science among the people who work in the field. It is simply not true that we, the scientific community, know almost nothing about the OOL (what an individual who spent a career working on fossils or fruit flies or speciation might know personally is a different question). Even though Nick says he is pretty busy right now, he does address the question and illustrates where scientists are looking now and have been looking for the last half century on the Origins of Life. Finally, the power of propagation possessed by each separate cell, using the term in its largest sense, determines the reproduction, the variability, the development and renovation of each living organism. No other attempt, as far as I am aware, has been made, imperfect as this confessedly is, to connect under one point of view these several grand classes of facts. We cannot fathom the marvellous complexity of an organic being; but on the hypothesis here advanced this complexity is much increased. Each living creature must be looked at as a microcosm – a little universe, formed of a host of self-propagating organisms, inconceivably minute and as numerous as the stars in heaven. Bam. It appears that everyone was wrong – scientists who sometimes made a minor offhand remark saying people used to think the cell was simple, and creationists who made a major talking point of this, and Slack who heard it so many times from creationists/IDists, without prominent contradiction from scientists that he believed it himself. Like various dubious statement about the OOL which I discussed above, the “Darwin thought the cell was simple” statement became an unquestioned factoid merely through creationist repetition and flawed assumptions from the critics of creationists – it seemed reasonable, nothing crucial hung on it for scientists so they didn’t bother to double check in a serious way, and besides it is a lot easier to agree with your opponent and declare on other grounds that their point is irrelevant to the fundamental issues, than to do a serious analysis. It might be true that a creationists’ point is irrelevant to the bigger issues, but it lets the creationists get away with something that should not be gotten away with, and through an accumulation of such points the creationists build up a body of claims that even sincere, intelligent, creationist-skeptical, reasonably well-informed people like Gordy Slack find reasonable. Then you get essays like the one Slack produced, and irate responses that shed heat rather than light, and encouragement for the creationist leaders to feel like they’re on the right track. If the Clashing Culture war over evolution is to be won based on the examination of the data, conceding incorrect points gives creationists ammunition. People who care about evolution really need to address all of the faulty points and not concede points as important as the 19th century view of the cell.